Spring season is a great time to experience a fantastic and wonderful vacation by the lake aboard the Showboat Branson Belle. With the showboat, you can experience a romantic cruise with your loved one complete with a delightful meal and amazing show. When you are aboard with the Showboat Branson Belle you will have the chance to enjoy fascinating views of the natural scenery as the boat travels along the lake. The time duration of the riverboat cruising on the lake will be two and a half hours which will let you feel a truly entertaining experience as you watch onboard shows while being served with a 3-course meal. 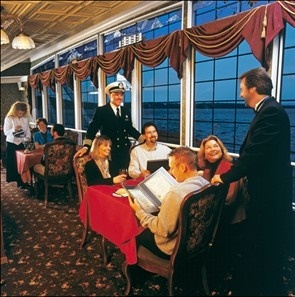 All throughout the year, the showboat hosts lunch and dinner shows. Showboat Branson Belle is considered the biggest ship in a landlocked lake in America. With the riverboat, you will enjoy exciting shows onboard which feature world-class performers like Comedian Christopher James, violinist Janice Martin, and The Showmen group. Janice Martin is not only a violinist, but also an acrobat, vocalist, and a multi-instrument musician. Janice really has a combination of talents that will amaze everyone when she is performing. Her mastery with the piano, violin, and vocals is such an excellent performance. The magic show of Christopher James along with his hilarious comedy will surely inspire everyone. The singing group The Showmen with fine male vocalists and dancers that come from all across the US will give you a complete entertainment. Todd Oliver and his funny talking dogs is another entertaining show that will make you laugh with tears. “Made in the USA” is a beautiful show featured onboard the Showboat Branson Belle which gives honor to the stars and stripes featuring the amazing voices of all female four-member quartet, The ShowBelles along with master pianist Julie McClarey and dynamic fiddler Dean Church. The show is hosted by magician and comedian Christopher James with the support of The Showboat’s live band, The Castaways. All audiences watching the varied musical performances of the “Made in the USA” are sure to applaud with great fun and excitement. This beautiful onboard show also features Janice Martin and The Showmen which is accompanied by a rockin’ live band. While you are onboard the beautiful Showboat Branson Belle you can have the chance to enjoy a unique shopping experience. Your cruising experience with the riverboat will not be complete if you don’t shop onboard. After you have disembarked from the riverboat, you can shop more at McAdoo’s Boatworks and Layton’s Mercantile at the White River Landing where you can see an array of men’s accessories, ladies’ apparel, jewelry, along with inspirational home décor and souvenir items. Candies, Silver Dollar City jams, coffee, preserves, jellies, and more can also be found in White River Landing boutiques. Before planning to book a regular Caribbean cruise or in any other part of the world, try to consider first a wonderful river cruise with the Showboat Branson Belle in the Table Rock Lake in Branson.